What are some of the possible explanations as to why this column appears on the mainland in this relief sculpture. 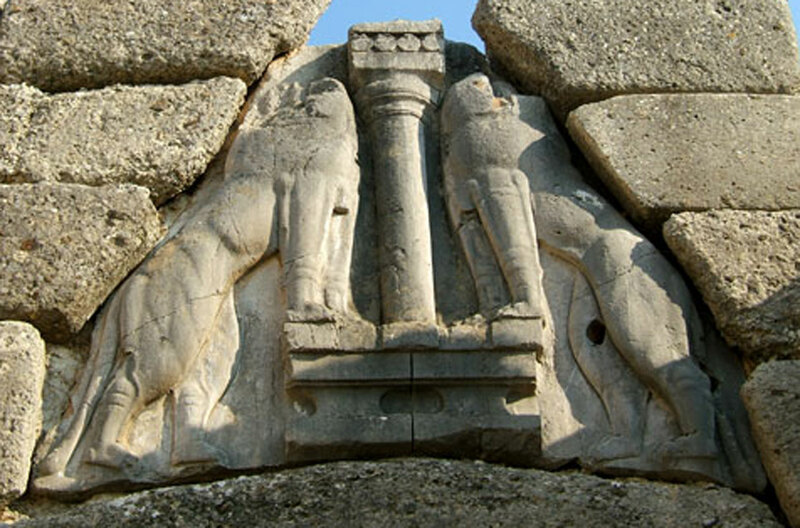 This is an image of the Lion gate which is very notable of the Mycenaen/Helladic period, 1300-1250 BCE. It was a gateway to go in and out the city.The ashlar which is the alternating course of masonary surrounds the the lintel and doorway and above the posts and lintel which is the flat surface is a 9 ft tall relief plaque of limestone. A person wearing armour cannot climb it,in the inside it was like a courtyard and the left walls are sloped. They could easily trow stones or boulders on people entering inside so it was very defensible. The plaque contains a column in the middle and two lion like creatures braketing the columns. their heads are missing and they might be having griffin heads like the Cretes.This is similar to the column at Knossos.All the carvings are in high releif which means that they are raised or pushed out in such a way that they no longer look like part of the stone they are carved from. The lions are symbols of pride and defense and they serve an Apotropiac purpose. The shape of the columns and the naturalisitic way fo showing the lions indicates that there was some sort of trade or connection between the two cultures.